Massive thanks to Aria M. for this recap! Tally Youngblood about to turn sixteen is ready to receive her operation when she’ll go from a hideous ugly to runway-worthy pretty and join every other stunning pretty in new-pretty town for a life of partying and fun. Only now, her new found ugly friend Shay has run away weeks before her own operation and Tally must turn her in if she ever wants to become pretty herself. However, on her mission to discover Shay she learns about the hidden horrors of becoming pretty and ends up questioning her loyalties whilst making some infamous new friends in the Smoke. Three months away from turning 16 and the surgery that will convert her from an ugly to a pretty, Tally Youngblood sneaks into new-pretty town to visit Peris, an old friend. While returning to Uglyville from New-pretty town, Tally meets Shay, another ugly sneaking out at night and they quickly become friends. As their friendship grows, Shay teaches Tally how to fly on a hoverboard. They discover their sixteenth birthdays are on the same day however Shay doesn’t appear as excited as Tally when it comes to the operation and becoming pretty. Shay introduces Tally to the Rapids and the Rusty Ruins, depicted as one of our developed cities today, only tarnished, abandoned and considered old fashioned in their world and Shay admits she intends to meet an infamous ‘David’ there, however this never occurs on this first trip. Tally continuously insists that she is ugly but Shay feels this is a result of their backwards society forcing this belief into them and they fight about this until Shay leaves. A week before their operations, Shay informs Tally that she is running away to a place where you don’t have to get the operation known as the Smoke. She invites Tally to come along, but Tally refuses so Shay leaves her with instructions on how to reach the Smoke just in case she changes her mind. It’s the day of the operation but instead of being taken to the hospital Tally is transported to Special Circumstances (the FBI headquarters of her world) and is introduced to Dr. Cable. Dr.Cable requests that Tally go to the Smoke based off of Shay’s directions and give up it’s location, or else she will never become pretty. Tally agrees to her demands and begins her journey. Tally spends the next week travelling to the Smoke amazed to see the nature outside of her small city and is greeted by Shay, David and the rest of the Smokies and welcomed without any suspicion. As she gets to know the Smokies, Tally is surprised by their rustic possessions and homemade crafts and is also beginning to get closer to David but this news makes Shay bitter with jealousy. One day, David introduces Tally to his parents (something he hasn’t done for many other people before so Tally’s obviously special to him) and she is shocked to learn they had once been pretties but had reversed their operations and then had David out in the Smoke. Tally learns from David’s parents that they had once been doctors when they lived in the city, surgeons who performed the pretty operation to be exact and that during the operation all uglies were secretly injected with lesions that made them brain-damaged and free of independant thought. Tally finally understands why David’s parents and all the other smokies had left their cities to avoid this brainwashing. That night Tally decides to destroy the necklace Dr. Cable had given her to alert the specials and give them the Smoke’s location, convinced that she will never return to the city herself and be brainwashed. The next morning Tally wakes up to chaos because special circumstances have arrived. Apparently destroying that necklace had automatically give up her location and now all the smokies are on the run. Many of them have been captured but Tally manages to escape herself and soon finds David on the run as well. They spend the night hidden in a cave but decide in the morning they’ll together try and rescue David’s parents, Shay and the rest of the smokies that were captured. The next ten days are spent returning to their city. They hide out at the Rusty Ruins while preparing for the rescue mission. Once inside Special Circumstances, Tally and David find Shay who has now been turned pretty and the rest of the Smokies, managing to barely escape but unfortunately discover that David’s dad, Az, has been killed. Maddy, David’s mom thinks she’s found a cure for pretties to not only eliminate the enhancements to their bodies during the operation, but also to destroy the lesions that make pretties brain dead. All they need now is a willing test subject. Tally volunteers to be the test patient for Maddy’s cure. She returns to the city with Shay and requests to have the operation done and become pretty. 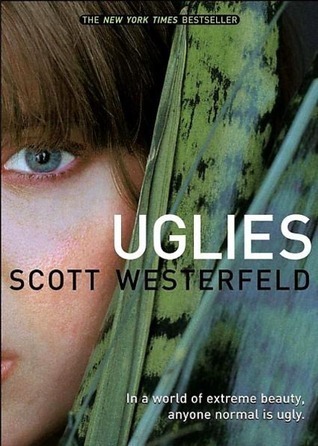 Uglies: Anyone who hasn’t had an operation to make them a stunningly attractive pretty. Mostly anyone under 16. Pretties: People who have got the surgery that turned them super-model gorgeous at the age of 16. Specials: The people at Special Circumstances that are basically the FBI in Uglies world. Rapids: Any large body of water. The Rusty Ruins: Any of our large cities today, except abandoned and rusted. The Smoke: The place where all the smokies that ran away from getting the operation in their cities have come to. Lifters: The magnetic lifters inside anything that hovers over iron, found in hoverboards, hovercars, etc.